A NEW five-star Wyndham Grand Manama hotel is expected to open by the end of next year with more than 260 guest rooms in Bahrain Bay area. Wyndham Hotel Group has signed an agreement with Cooperation Investment House (CIH) to manage the hotel in its prestigious landmark 50-storey building. Currently under development, the $250 million project will include commercial office spaces and approximately 1,300 car parking spaces. The investment in the hotel project itself will total $150 million. The project will cover a plot area of 4,500 sq m and the total built up area will be 120,000 sq m.
Wyndham Grand will cover 14 floors of the mixed-use development. Rooms will range from 46 m to 120 sq m. Complemented by indoor and outdoor infinity swimming pools and separate health clubs for men and women, the development will also include five food and beverage outlets catering to a variety of tastes. It will also have 500 sq m (nearly 5,400 sq ft) of meeting space and a 900 sq m ballroom on the building’s top floor, offering stunning sea views. Bahrain Bay Development is a $2.5 billion waterfront district designed around vibrant neighbourhoods of residential, commercial and retail spaces. 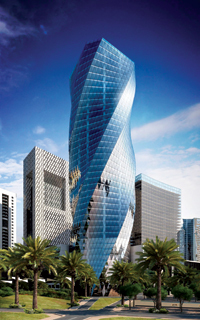 Set in this unique new development, the Wyndham Grand Manama will face the World Trade Centre, just a short distance from Bahrain Financial Harbour, making it well placed to cater to business as well as leisure travellers. Wyndham Hotel Group is the world’s largest hotel company with over 7,170 hotels and part of Wyndham Worldwide Corporation.